Bjarke Ingels' architecture studio BIG has designed a limited-edition ceramic vase modelled on an inflatable art pavilion that it designed in 2016. 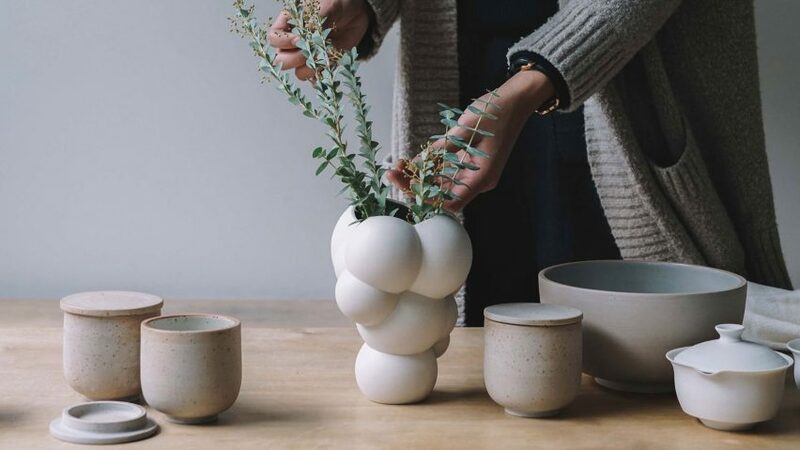 Made up of conjoined spheres that resemble a cluster of bubbles, the porcelain vase is a scaled-down replica of part of the inflatable pavilion that BIG designed for Danish brewer Tuborg. Named Skum, the Danish word for foam, the white pavilion was originally designed with bouncy castles in mind. The matt white porcelain Skum vase, which measures 17.8 centimetres high and 13.4 centimetres wide, was produced by interior-design platform Mosss. The San Francisco-based company created the vase in honour of a recent video workshop collaboration with BIG founder Bjarke Ingels. The brief set for BIG by Mosss was to design a small household object based on one of its designs. The design were rendered using 3D modeling software, which allowed the architects to see and evaluate all dimensions of the vase before creating physical prototypes. After the form was decided upon, the studio created 3D-printed prototypes, testing various sizes before deciding on the current scale. The final design is made from high-grade porcelain, which is carefully sanded and finished by hand, while the interior is sealed to be water-tight. "Like the inflatable installation, the Skum vase has a bubble-like form and captures a sense of creativity, whimsy, and play," said Mosss. "As the pavilion continues to travel the world from music festivals to art fairs, a small fraction of it can now populate private homes, reincarnated as the Skum vase." BIG, which ranked number four on Dezeen Hot List 2017, is currently designing buildings across the world, including a chequerboard-covered stadium that will house the Texas rodeo and a "bow-tie-shaped" theatre in Albania's capital.